Since moving to Boston, Kyle Slidell has met only a few of his neighbors, including Tobias Rogan. Kyle is very interested in Tobias, and is ecstatic to learn that Tobias wants him too. But his neighbors have a secret: They're werewolves, and Tobias is the pack Alpha. When one of the wolves attacks Kyle in the neighborhood garden one night, Kyle learns the truth in a hurry. Now he's a werewolf too-and since he's vegan, he refuses to eat meat. With Tobias's help and love, Kyle must adjust to his new life and protect himself and his friends from a neighboring pack. 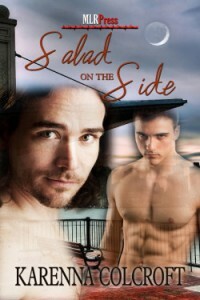 I went into this story all stoked on the premise of Salad on the Side. A werewolf who has philosophical issues with his usual foodstuff is going to have bigger worries than just getting furry. Karenna Colcroft could have played it several different ways, from comic to a matter of life or death, choosing to work it in as just another detail of shifter life and not trying to make it carry the entire weight of the book. This pack has more to be concerned about than a picky eater. In spite of the unusual twist, I didn't really warm up to Kyle. He doesn't have much going on, existing as a work drone, with enough depth to stick to his convictions, more or less, but shallow enough to pat himself on the back for his good looks in the middle of a tender moment. A man who says, "I'm vegan. I'm not always good at it," to excuse the lapse he wants to make might think a little bit more about what he needs to do to stay alive. Tobias, the alpha werewolf, is a mess of contradictions. He's worried about appearing weak because he wants a male mate when he should be more concerned about being weak; he's not an especially good leader. He's strong, but an Alpha who hates being able to compel his wolves but can't prevail by force of will or by persuasion has to make up his mind what he's going to do. A leader who repeatedly allows his least wolf to disobey him with little more consequence than being sent to her room, but raises his hand to his lover for a legitimate comment, probably should get challenged. The relationship between Kyle and Tobias was one of the joys of the story. Tobias is sweetly virginal with another man, but grows and flowers with more experienced Kyle's attentions. However, I do not especially want to hear about Kyle's past lovers when Tobias is there and naked. Still, these two do complement each other in bed and out, and I was glad for their happy ending. “Too much discussion,” Mr. Frelich grumbled. “All we’ve done today is discuss. Alpha, with all due respect, we need to act."